Maxwell Humimax is a highly efficient enhanced foliar absorption formulation, created specially for tank mixing. HumiMax has been formulated to stand out from the crowd in terms of key benefits and performance. 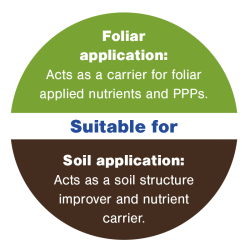 10% increase in nitrogen use efficiency, when used with granule fertiliser - leading to reduced fertiliser application requirements. 30% increase in nitrogen use efficiency, when Humimax is used with foliar fertiliser - leading to reduced fertiliser application requirements. Increased efficacy of fungicides and herbicides. Active ingredients: 100% Natural, Pressure Extracted Leonardite - Including 20.5% Humic acid & 4.5% Fulvic acid. Maxwell HumiMax – A superior liquid humate, derived from a naturally occurring source that operates in a multi-functional manner; both in the soil and as a plant component, via a micronised formulation which retains all the beneficial natural properties. ✔ 10% increase in nitrogen use efficiency, when used with granule fertiliser - leading to reduced fertiliser application requirements. 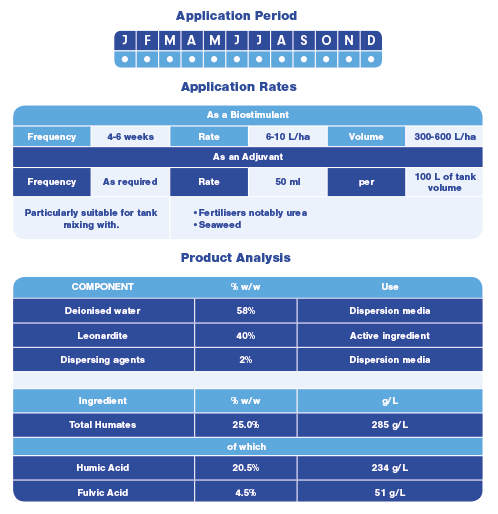 ✔ 30% increase in nitrogen use efficiency, when Humimax is used with foliar fertiliser - leading to reduced fertiliser application requirements. ✔ Increased efficacy of fungicides and herbicides. ▷ The natural chelating properties and enhanced leaf penetration efficiency retained by the pressure extracted humates. ▷ The uniform distribution across leaf surfaces because of the micronised suspension technology. ▶ Hasten the establishment of newly sown areas by stimulating nutrient uptake within the plant and providing a source of polyphenols, which catalyse plant function, intensifying cell division and consequently increasing root and shoot development. *Molecular structures for illustrative purposes only. Solubility within water. Each humate compound plays a vital role in healthy soil life and plant function. In a healthy functioning natural soil, humates occupy up to 50% of the soil organic matter complex. Leonardite is a naturally occurring oxidized mineral derived from concentrated humified plant deposits. Leonardite is rich in organic substances essential for the healthy function of soil structure, soil-biology and plants. These organic substances are known to be depleted in many top soils, growing media and sports turf profiles. Humus is the remaining part of humification, the process of microbes decomposing organic matter in the soil. Humus forms a stable component of the organic matter present in soils. Humus performs many vital functions within the soil complex, it interacts positively with soil particles, soil nutrients, soil biology and plants. 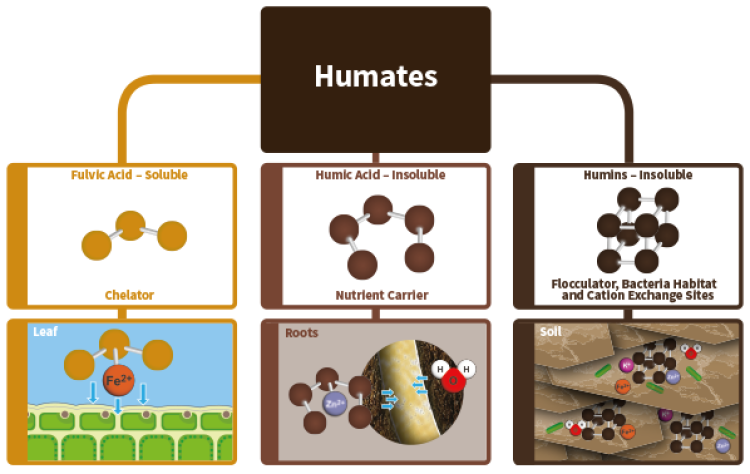 Humus drives the naturally evolved functions and interactions between all of the fundamental constituents and processes of an efficient and healthy soil biosphere. 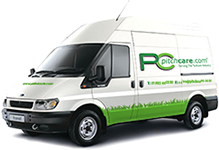 Increasingly growers and sports turf managers at all levels are understanding that respecting and nurturing these processes is a key component in the successful production of high quality sustainable turf surfaces. Humus is formed of various complex organic components referred to collectively as humates. Fulvic acids – small complex molecules and the fraction of humus soluble in water. Fulvic acids are highly biologically active due to their small molecular weight. This allows fulvic acid to dissolve minerals and elements into its structure, at which point they are referred to as mobilised fulvic complexes. These natural complexes are then in a form which easily interacts with and is absorbed by living plant tissue. Fulvic acid is nature’s method of chelating metallic minerals into a bioavailable form. Fulvic acids also capture and transport a range of plant substances such as vitamins, amino acids, auxins, enzymes and hormones. Humic acids – complex molecules larger than fulvic acids. A fraction of humus not soluble in water. Humic acid acts as a major carrier of nutrients into plant roots via a transfer mechanism which operates as the plant absorbs water. The negative charge of a humic acid molecule attracts and bonds with positively charged nutrients (cations) in the soil. The bonded molecules are then transported with water towards the roots and into the plant. Hydrogen, Oxygen and Carbon are the most abundant elements present within a plants body, they are sourced via photosynthesis and water. When absorbed by plants the organic structure of humic acid molecules has been shown to mobilise hydrogen and activate oxygen, which in turn drives core plant processes. Humic acid also provides a supplementary carbon source for plants and soil biology which drives balanced, increased nutrient processing and uptake within the rhizosphere. Humins – closely associated with humic acids, a fraction of humus not soluble in water. Humin molecules represent stable carbohydrate like materials which form an aggregate component within the soil. Humins attract nutrients and organic molecules otherwise strongly bound to soil particles and provide a site for soil microorganisms to process them via enzymes into forms which then serve to further nourish other soil life and plants. HumiMax is used as part of an intergrated nutritional programme at Willesley Park Golf Club. For further information regarding Maxwell HumiMax, please contact our technical sales team on 01902 440250.